FREE DOWNLOADS: FREE Thanksgiving Fun! 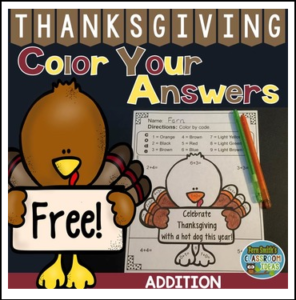 Thanksgiving Addition Facts – Color Your Answers Printable! FREE Thanksgiving No Prep Printable that can be used for your math center, small group, RTI pull out, seat work or homework. One copy for the students and one copy with the answers for some fun for Thanksgiving! Click here to see my Thanksgiving Fun! Addition – Color Your Answers Printables. CLICK HERE for more Color Your Answers resources. Keywords: FREE DOWNLOADS, FREE DOWNLOAD, Free, Freebie, Addition Printables, Thanksgiving, Addition Color By Code, Addition Color Your Answers, Thanksgiving Color By Code, Thanksgiving Color Your Answers, Seatwork, Daily Five, Turkey, Thanksgiving Turkey, Thanksgiving Turkeys, Turkeys, Seasonal, Autumn Theme, Fall, November, Math Stations, Small Group Remediation, Homework, Fern Smith’s Classroom Ideas.